This set of machine embroidery designs is part of our Angels collection. It uses the Satin Stitch technique. The designs will fit the Small hoop (4" x 4"). 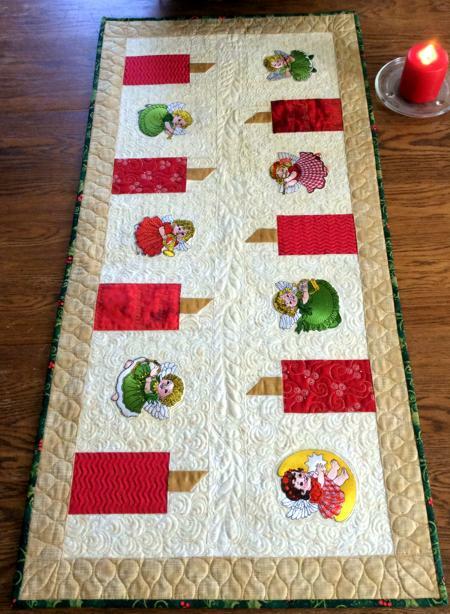 You can read about how to sew this Christmas tablerunner on the project page. You can read about how to sew this baby quilt on the project page. We changed the colors of dresses so that they match the colors of fabrics. The redwork angels are from the Musical Angel Redwork Set. This photo was sent in by Faye Watson from Cornelia, GA as her Best Project Contest 2009 entry. To read more about the project go to the customer's page.